It is no secret that I have been quite smitten with elephants for a while now! They are playful and powerful animals who remind me of the wilder side of my own heart. For the past several years, I have been on the lookout for someone who could introduce me to elephants in a way that expanded beyond mere facts and scientific data, someone who was versed in the wisdom of these magnificent creatures. As it often goes, life heard my intention and Alan McSmith and I crossed paths. Alan’s a South African safari guide who has developed quite a reputation for his special connection with elephants. 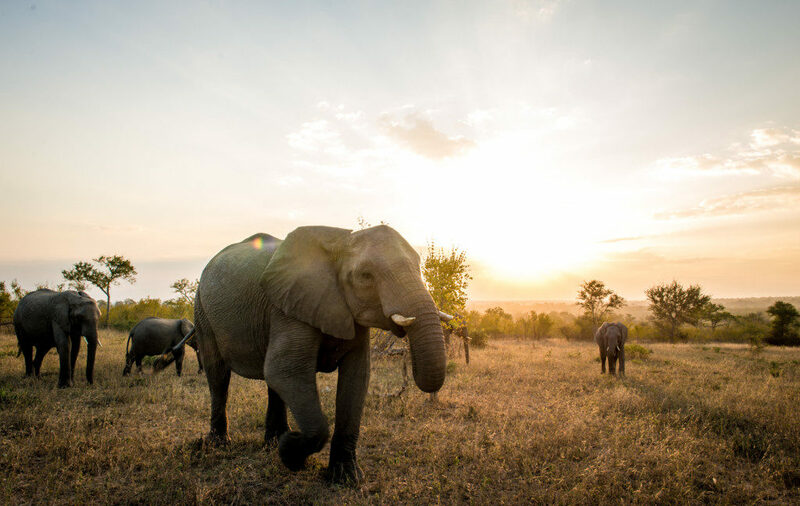 Alan and I recently spent four days tracking wild elephant herds as they foraged on the Londolozi Game Reserve on the outskirts of Kruger National Park. It was truly incredible. 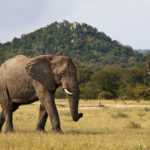 Like horses, elephants form breeding herds comprised of anywhere between ten to forty females and their calves and usually one older breeding bull. Each day at sunrise, we located a herd and sat with them for hours in silence as they grazed. Sometimes, we sat in our open-topped Land Rover and let the herd approach us. Other times, we sat directly on the ground, with a larger distance between us, but still close enough so that we could interact with them. During our first morning, one of the cows (the female elephants are called cows), walked over to the side of the Land Rover where I sat. There wasn’t a whole lot for her to munch on in this particular spot, but she seemed curious to get to know me. She continued to come closer and closer until she finally stopped, a mere five feet from me. I’ve been coming to Londolozi for roughly eleven years and I’ve never had an elephant position herself so close. If she were to have stretched out her trunk, she would have touched my face! I noticed my heart rate increase with equal parts joy and fear. I had been told many times by experienced game rangers that female elephants with calves are very protective and can easily become agitated. “They are the ones you have to watch out for!” they’d often said. Part of me was so eager to witness and learn from this beautiful elephant. Another part was acutely aware of her enormous size, strength, and power! Given her proximity, if she became unhappy for any reason, I could easily become the next uprooted tree, so to speak. Thanks to my experience with horses, I knew that I had to create a clear energetic state within myself if I wanted to move beyond the fearful stories others had given me and open myself to some form of connection with this beautiful elephant. I slowed down my breathing and centered myself in the moment, settling my mind into a state of openness and sensory awareness. My breathing deepened and my heart rate returned to normal. I looked into her eyes. They were a rich caramel brown and emanated a soft, relaxed ease. My body softened too, and I became deeply curious. What was this elephant thinking? Was she as curious about me as I was about her? What would it feel like to move through the landscape alongside her as our tribal ancestors might have done? How amazing would it be if we could all use such incredible technology to communicate! The cow stood there next to me while her calf suckled, for how long I don’t know, 30 minutes at least. Time seemed to stop as we sank into each other’s frequency. Then, slowly, she turned and walked away to continuing her morning grazing. This was one of the most magical experiences of my life. Just one or two generations ago, this elephant’s family members would have been hunted by human beings, killed either for their ivory or culled to lower the overall elephant population in the park. Her mother and grandmother surely would have passed down their well-warranted fear and extreme caution for the very real danger human beings posed. I thought of my own fear about the danger she posed to me, passed on from the other rangers. Despite all of this, somehow this elephant and I were able to meet in the pure awareness of the moment. Our desire to connect outweighed any memory, story, or fear we had and we sank into a deeper way of communicating, through the language of awareness. The language of awareness is that sensory experience of participation in the world. It’s the nonverbal, or pre-verbal, experience of feelings, energy, intuition and sensation. Before our mind has a chance to translate the experience into a verbal language or make meaning out of it. Alan and the other trackers have spent years submerging themselves into an awareness of the bushveld. They understand everything that’s going on because they know the unique symphony of the landscape and its variety of moods— the bird calls, the animal migrations, the cycles of weather, the wind patterns, the movement of the stars. Each of these elements tells a larger story of the overall feeling of the environment. The trackers have an embodied awareness of this, which allows them to engage with it in profound ways and translate it into a wide variety of stories and narratives. As I sat watching the calf suckling her mother, I soaked in the feeling of ease and safety that was emanating throughout the environment. I began to wonder, how often do we miss the universal language of awareness (the feeling of what is there between beings or what wants to form within the current environment) because we’re operating from within the limits of our past memories and the verbal language we’ve been given? If I wasn’t willing to go beyond the limits of my verbal language and my storytelling I’m confident my fears and tension would have communicated a much different message to the cow and she would have likely relocated to a place that felt safer to her. The natural world is constantly communicating with us. If we listen from within the limits of our preconceived ideas and stories, we miss what it is saying! In order to participate, we have to expand into that universal language of awareness. We have to open ourselves to the overall feeling and presence of the environment. To me, the universal language of awareness is a place where we can meet one another and begin to build an entirely new connection. We all have a birthright to this foundational participation. We all have the ability to open ourselves to a state beyond our conscious verbal mind and what we know or think we know. Awareness is about discovery. It is about dropping any stories or preconceived ideas we might have and opening ourselves to uncover what is. It is me and that beautiful elephant meeting face to face and sinking into each other’s breath and smell and movement. She doesn’t need to speak English and I don’t need to project sound vibrations through the earth. We feel one another. We feel the moment. We feel the mutual curiosity and respect. Without the clouds of fear and without much conscious thought the universal language of awareness is there. We both know the language by heart. This is our natural way of being. We experience it every day whether we are aware of it or not. We used to migrate with the animals and follow the natural rhythm of the seasons. We didn’t see ourselves as separate or disconnected from the natural world. Can we still feel into the subtle energetic shifts and intuitions that life provokes in us? Can we return to our place in the family of things? I hope so. It is in that awareness that we can create new patterns, new stories, and new relationships and where new possibilities are waiting for us beyond anything we have known. Return to the Heart Retreat: Return to Your Original Language—The Language of Energy. Oh Koelle ! I too love elephants and have visited Thailand and Londolozi . I have had similar experiences as you discussed with their trunks sniffing so closely – you could touch ! We might share those magical moments sometime. There are no words to express that connectedness . I didn’t have the 30 minute connect – but I had a few shorter ones that were just as intense and magical. I felt so honored and privedeged to have those gifted connections.